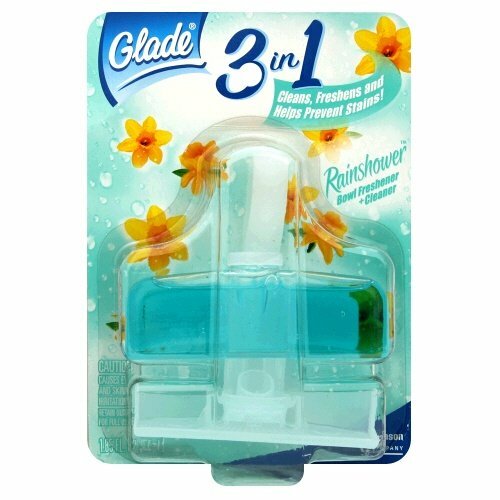 Features Glade 3 in 1 Bowl Freshener and Cleaner, Rainshower. Cleans, freshens and helps prevent stains! Comes with an adjustable hook. Leaves the water clear. Lasts up to 30 days. Now Glade Bowl Freshener and Cleaner brings you a great combination of quality fragrancing and continuous cleaning with every flush. Only Glade Bowl Freshener and Cleaner delivers a burst of naturally scented Glade fragrance every time you flush, keeping your entire bathroom fresh for up to 30 days. Cleaning agents are released directly into the bowl, cleaning your toilet automatically flush after flush. Sold in case of 6. Glade 3 in 1 Bowl Freshener and Cleaner, Rainshower. Cleans, freshens and helps prevent stains! Comes with an adjustable hook. Leaves the water clear.